Many people undergo a kind of shift in their personality -- large or small -- as the years go by, and usually that comes in them abandoning their wilder, rebellious tendencies for a version of themselves that's tamer, self-aware, and, y'know, a bit more socially acceptable. Few undergo the drastic type of transformation that Colleen does in Little Sister, though, where she abandons the brightly-hued hairstyles and brashness of the alternative scene for the sanctity and restraint of the church. Such an adjustment suggests that there might be a complicated story of realization at the heart of her story, yet despite the interest that it might pose, examining the depths of her character isn't the focus of this story. Instead, Zach Clark's indie drama merely brushes against those deeper musings about what led Colleen down her unique path from goth girl to buttoned-up nun, opting instead for loosely-connected observations of how this new version of herself reconciles with her damaged and dysfunctional family. At the beginning of Little Sister, Colleen (Addison Timlin) is on the cusp of taking her vows to become a full member of her selected nun community. Due to some uncertainty and conflict with whether she absolutely wants this for her life, she decides to travel to Asheville, North Carolina, her hometown, to regather her thoughts and answer some internal questions ... as well as visit her brother (Keith Poulson), a war veteran, who was disfigured in battle. It's a place that she's avoided for quite some time, both in person and through phone calls and emails, so a little bit of surprise can be felt when she discovers the state of her family. Her brother, Jacob, whose burns cover the entirety of his face, has become highly reclusive and somewhat neglectful to his fiancée, Tricia (Kristin Slaysman); her mother, Joani (Ally Sheedy), who copes with a mental illness, has resorted to recreational drugs to improve her mood. When she arrives to find her bedroom looking the same as in her goth-girl days and her family in this peculiar state, Colleen slides back into her some of her old ways. Someone returning to their hometown after a long absence and confronting who they once were, reconnecting with old friends and family members in the process, certainly isn't something new for comedic dramas, ranging from Grosse Pointe Blank's jagged humor to Garden State's bittersweet musings on guilt and depression. What sets each one apart is the distinctiveness of the characters returning home and the purpose that the storyteller holds in bringing them back, an area where Little Sister holds a lot of potential in Colleen's conflict of faith and past experiences. Instead of focusing on the mental space of the young nun, writer/director Clark broadens the scope to include the entirety of the Lunsford family, highlighting how her presence upends everyone's day-to-day. While this gives Little Sister more interactive authenticity, accentuated by Colleen's efforts to cheer up her brother and how she draws the irrational ire of her mother -- a piercing and complex role embodied by Ally Sheedy -- it also distances the audience from a deeper glimpse at who Colleen really is. 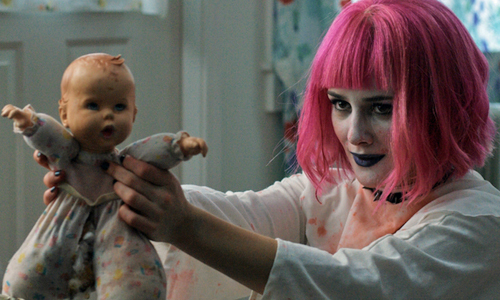 Thus, Little Sister comes across as something of a missed opportunity at examining its focal intriguing character, especially when taking Addison Timlin's reputable performance into consideration. Timlin appropriately realizes the meek, frustrated attitude of a once-free spirit now bridled and seeking worldly answers, someone whose insecurity with a controversial decision like becoming a nun can be felt both in her body language and in the impact she has on those closest to her. Her relapse from the cardigan-wearing woman of the cloth to her pink-haired self of the past creates short-lived, uncommitted windows into her reasoning, mostly emerging when she gets together with an old, somewhat rebellious friend, Emily (Molly Plunk), who proves to be a bad influence in the best of ways. Frustratingly, Little Sister instead tries to spread attention out to the full breadth of the family's issues, going into themes of post-trauma seclusion with Jacob and depressive self-medication with her mother, reaching deeper into their internal conflicts than it even goes into Colleen's. That's the movie I was eager to see with Little Sister, one that really gets its hands dirty with moral issues and a deeper understanding of Colleen's choices, yet instead director Clark finds restrained, placid humor and reactive drama in the process of the family reconciling and moving forward. Over the course of a week, the film stumbles through arguments, conversations, and party atmospheres that nudge the characters into compromising situations, tapping into the sort of quirky under-the-radar comedy that raises eyebrows instead of generating laughs. It's the brand of humor that also relishes long shots of characters dancing weirdly, then hopes that it all works as a reflection of how they've changed over the course of the story, growing even stranger and more warped as the mother's penchant for drugs more directly impacts the course of later events. Through a mild gauntlet of sinful acts and reminders of where she came from, Colleen does reach a new liberated outlook on her life and her job, but Little Sister keeps one too distanced from those internal epiphanies to make it meaningful.